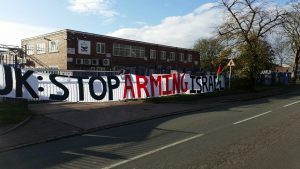 It is time to let the israeli war machine know we are like stars and we will not disapear that the fight for justice is everlasting.On 19 dec 2016 groups and campaigners from across the UK are going to protest at Elbit’s factories across the uk to demand that the UK stops arming Israel and that the factory close. Elbit Systems manufacture UAVs (drones) that are used by the Israel Defense Forces in Gaza. The assault on Gaza of 2014 which killed over 2,200 Palestinians, was one of the most brutal examples of Israel’s ongoing occupation and ethnic cleansing of Palestine. Palestinians, including 551 children, were massacred in a duck shoot by the Israelis, who launched high ordinance missiles into Gaza’s residential areas, schools, hospitals and refugee camps, the most overcrowded area in the world, At the time, activists occupied Elbit’s factory in Shenstone, halting its operations and costing Elbit over £100,000. Shenstone is a small village outside Birmingham, accessible by National Rail trains. The Elbit factory, UAV ENGINES, is five minutes walk from Shenstone railway station which is on the Longbridge Lichfield cross city line.Trains are every 15 minutes from New Street station. If you are coming from a big city where there is an active Palestine Solidarity movement it might make more sense to book a mini-bus or coach instead – please coordinate with us via our email (above). Pots, pans, air horns, megaphones, any noise-making devices. We want to make the day as accessible and inclusive as possible. If you have access needs or will be coming with children and would like to discuss practical arrangements, please get in in touch via email (above). A network of people in Birmingham taking (direct) action against Israeli apartheid through BDS & other participative Palestine solidarity work.